Event: You can change your city on August 19th at 7.00pm. 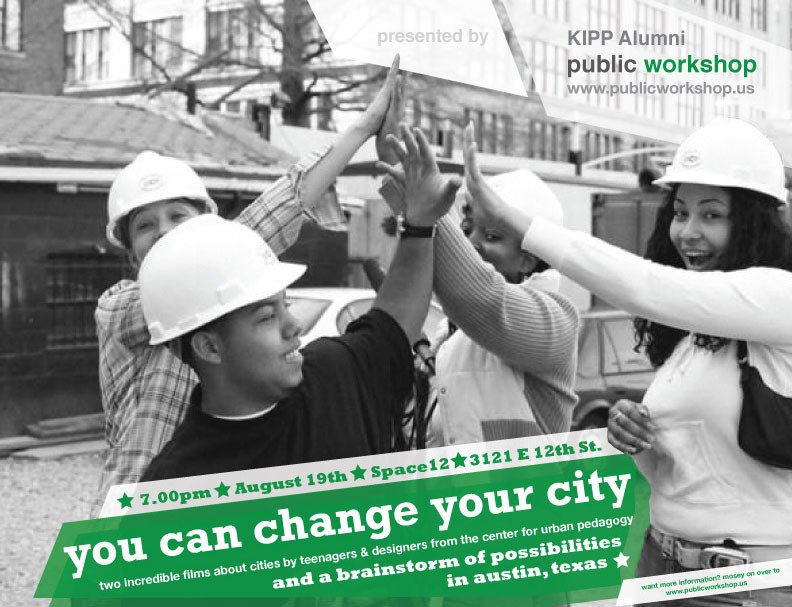 The KIPP Austin Alumni Program and Public Workshop partner to present two incredible films about cities by teenagers and designers from the Center For Urban Pedagogy (CUP) on August 19th at 7 pm. This summer teenagers from the KIPP Austin Alumni program have been working on a film series, generously hosted by Space12 (www.space12.org) at 3121 East 12th St. The final event of the summer will be on Wednesday, August 19th at 7:00 pm. Partnering with Alex Gilliam of Public Workshop (www.publicworkshop.us) they will screen two incredible films by teenagers and designers from the Center For Urban Pedagogy (CUP) in New York City. CUP (www.anothercupdevelopment.org) uses film making as a creative mechanism for education and engagement in important community issues. This is a particularly critical issue at the moment in Austin because of the impending work on the Comprehensive Plan. While the issue of youth involvement in this process is a hot topic, the manner in which we involve them should be examined as well. CUP’s films are great examples of alternative ways that young people, designers or anybody can engage with and have an impact on the design of our cities, and neighborhoods. After viewing these films there will be a brief presentation and then a brainstorming session about how to Make Austin Weirder . Are there new Austin-appropriate ways that we can all, especially our youth, better participate in the shaping of Austin’s great future? How can you Make Austin Weirder? Want to learn more about the Center for Urban Pedagogy? A collaborator and friend of Public Workshop, the Center for Urban Pedagogy has been doing outstanding, award-winning work for many years. CUP makes educational projects about places and how they change.Their projects bring together art and design professionals – artists, graphic designers, architects, urban planners – with community-based advocates and researchers – organizers, government officials, academics, service-providers and policymakers. These partners work with CUP staff to create projects ranging from high school curricula to educational exhibitions. Their work grows from a belief that the power of imagination is central to the practice of democracy, and that the work of governing must engage the dreams and visions of citizens. CUP believes in the legibility of the world around us. What can we learn by investigation? By learning how to investigate, we train ourselves to change what we see. You can watch their most recent film, The Internet Is Serious Business online by clicking here. Other questions about the evening?